· shielded multi-pair cables with an overall shield. The so-called digital cables are extremely good for analogue audio signals too. This is because of their low capacitance and improved shielding properties. Just as important is the double shielding capabilities of shielded multi-pair cables with an overall shield. A variation on this theme is cables where the shields of the individual signal pairs are insulated from each other. This type of cable is essential for interfacing legacy equipment into fully or partially shielded systems. 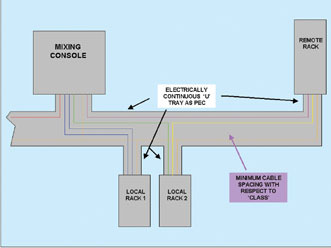 Some of the techniques outlined in section 7, rely or are simplified by using this type of cable. Cables are so important, we must include some basic notes to help with practical system design and wiring. These notes are taken from “EMC for Systems and Installations” by Tim Williams and Keith Armstrong – . Please refer to the book for a detailed analysis. In almost all cases the wanted or intended signal currents within the cable are flowing in differential mode. A minimum of two conductors are required for each signal, where one conductor carries the “go” current from the source to the load and the other the “return” current from the load back to the source. If the circuit could be considered in isolation, the two conductors would only carry the intended signal. This description applies to power or signal currents, balanced or unbalanced. The main point is that the current in one half of the conductor pair matches and reflects the current in the other half. Magnetic coupling in differential mode is directly relevant to the above description for differential mode currents in a cable. The loop area of the circuit is dominated by the distance between the go and return conductors of the cable, multiplied by the cable length. The resultant coupling being proportional to the loop area. In practice, it is often a small segment of a cable that runs close to a severe emitter or sensitive potential victim that causes interference. In this case, the coupling is not with the whole loop, but due to two closely spaced conductors carrying equal but opposite currents. Conductor pairs should therefore be as closely coupled as possible within a cable bundle, but sensitive cables should be kept well away from potential aggressor circuits. One of the best ways to ensure close coupling of signal conductors is to twist them tightly and evenly together. Electric field coupling in differential mode is related to voltages on the conductors rather than the current flowing in them. Here, the coupling of an external electric field, results in a voltage being developed between a conductor pair - or the voltage applied between a conductor pair produces an electric field. The coupling is sensitive to the polarization of the field. No coupling exists for fields normal to the plane of the conductors, but maximum coupling exists within the plane. For a constant field strength, the voltage induced is proportional to the conductor spacing and is also dependent on the exposed surface area of two conductors and on the impedance of the circuit. Thus the advice on conductor pair spacing is the same as for magnetic coupling. Luckily, shielding techniques work well in controlling electric fields, as do twisted pairs. Separate consideration of magnetic and electric field coupling in differential mode can only be applied accurately for low frequencies where the cable length is a small fraction of a wavelength (this is generally agreed to be in the order of one tenth of a wavelength or less). As cable dimensions become equal to or are greater than a wavelength, the resulting phases of the induced currents and voltages vary with their spatial position along the cable. At the connector end of the cable, the quantities vary from zero to a maximum, depending on the relative phases at each incremental point alone the cable, and vary periodically with frequency and the spatial distribution of the fields. (i) I(go) not equal to I(return) in a conductor pair, so that [I(go) – I(return)] is not equal to 0. The difference between these differential mode currents is the common mode current and is directly related to the signal carried on the cable. (ii)External influences, unrelated to the power or signal carried, couple with the cable equally on all conductors and induce current equally on all conductors. The cable acts as a single conducting structure. A successful cable installation is thus one in which the common mode disturbances are kept separate from the differential mode desired signals. Common mode currents may also be generated by the equipment at either end of the cable, and then radiated by the cable acting as a disturbance emitter. Conversely, disturbances from external sources can be induced on the cable producing common mode currents that are conducted into the equipment at either end. Common mode emissions that have nothing to do with the signal carried by the cable are not only a common cause of failure to meet compliance requirements, but are a major reason for interference in analogue systems from high-speed digital circuits. Such emissions can be seen to occur even when a single wire is connected to an apparently fixed circuit node, such as circuit 0V. The cable acting as a disturbance receptor is the most common coupling route in cases of susceptibility. The common mode voltages and currents induced in cables and presented at the connectors of the apparatus can so easily be converted to differential mode and then appear at internal circuit nodes differentially. A cable shield will carry common mode currents just as will the conductors of an unshielded cable. However, the shield of a shielded cable is intended to do this. 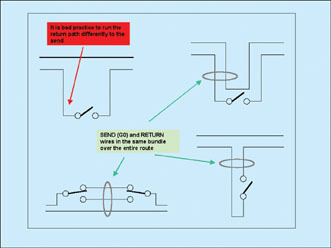 While good equipment design and correct shield termination techniques can prevent the common mode signals from penetrating into the circuits, segregation and routing of cables is a vital factor in controlling common mode coupling at system level. For both emissions and immunity, the cable is acting exactly like an antenna, and its coupling efficiency is very much greater in common mode than in differential mode. With respect to cables, crosstalk means the coupling between separate circuits in the same cable loom, so that the system interferes with itself. The mutual capacitance and inductance between two conductors that form each circuit pair are not a problem. It is the mutual impedances between circuit pairs that gives rise to crosstalk. Capacitive crosstalk between circuit pairs is minimized in balanced circuits, while unbalanced high impedance circuits are the most vulnerable. Shielding each pair individually will remove capacitive crosstalk almost completely, assuming that the shield is connected to a fixed potential such as earth/ground or circuit 0V. Since most shielding techniques are less than 100% effective, voltages will be developed longitudinally along the shield due to resistance. Thus the limiting factor in capacitive crosstalk suppression, is shielding effectiveness. Inductive crosstalk by itself is very much less of a problem than capacitive, particularly if the send and return conductors have good symmetry (e.g. a twisted pair). At high frequencies, the cable must be considered as a distributed structure. The phase differences along the cable length become significant, and inductive and capacitive crosstalk results in frequency dependant interference at the ends of the cable (see figure 14). Equipment manufacturers should provide information on cable and connector types to be used in their installation instructions. It is important to discuss cable and connector details before purchasing equipment since the cost of special cables and connectors to allow an apparently low cost sub-system to work satisfactorily, may be more than an apparently expensive sub-system whose superior design allows the use of low cost cables and connectors. At the very least, the following options should be considered. (i) Twist the send and return current conductors together for every individual load. Do not rely on any other wire or cable (or cable shield) to carry the return currents. This means using twisted pairs, twisted triples or even twisted quads. (ii) Only use coaxial cables when the manufacturer specifies them as being suitable. In general, coaxial cable is not very good for low-to-mid frequency EMC. (iii) Foil shielded cables with a drain wire, should be given 360 degree bonding for the foil shield, and the drain wire should terminated at the same gland or directly to the connector shell. Do not use the drain wire for shield termination on its own. (iv) Overall braid shields are electrically superior to overall spiral wrapped foil shields. (v) The effectiveness of braid shields improves with its optical coverage. (vi) Overall braid and foil shield, or double braid, is better than any single shield. The best configuration for braid and foil cables is when the braid is in contact with the conductive side of the foil, thereby shorting out its turns. (vii) Individual twisted pairs, triples, quads in an overall shield often need individual shields to prevent capacitive crosstalk between signals. A number of manufacturers can now supply cable with individual foil shields plus an overall braid shield. (viii) Multiple isolated shields are sometimes better than non-isolated shields, although resonances can severely limit their effectiveness at some frequencies. (ix) Double shielding, where the outer shield is a circular metal conduit (pipe) is extremely effective if all joints (in both shields) are 360 degree bonded at both ends. (x) Cables designed as “low capacitance” and/or “high velocity factor” will generally be better for carrying data over long distances. (xi) For high speed data or long distance transmission, the characteristic impedance of the cable and its connectors must match the specification for the “physical layer” of the data standard, which may also specify the build of the cable. The manufacturer must specify cable and connectors precisely if the datacomms specification is proprietary. Obtain an industry guide if a published communication standard exists. The shielding performance is formally specified in the “transfer impedance” parameter ZT of the cable. This is the same concept as the transfer impedance of structures discussed in section 3, but specifically related to shielded cables. The ZT parameter is a convenient way to compare different cables and makes. Unfortunately, catalogue descriptions rarely refer to the ZT parameter, although most manufacturers can quote it when requested. For most flexible cables, ZT starts to rise at high frequencies (> 1MHz). Only a solid copper shield or expensive ‘superscreened flexible cables (which are wound with high-permeability metal tape as well as braid) can provide really good shielding at frequencies above 100MHz. No matter how good the cable shielding might be, the overall transfer impedance of a system connection is dominated by its end terminations. Cable shield RF bonding requires that glands, connector backshells, saddle clamps or P-clips achieve 360 degree electrical contact to the metal surfaces that they are mounted on at both ends of the cable. The EMC performance of the cable is wasted if 360 degree coverage is not continuous from end to end. Connectors that are properly designed for shielded cable pay particular attention to the series impedance presented by the shield termination. One of the best examples of this is the N type RF connector, which can maintain system performance up to 18GHz. Even the diameters of the various parts are controlled to minimize deviations in characteristic impedance through the connector. General purpose shielded connectors do not need to maintain characteristic impedance, but they should ensure proper 360 degree contact through the shield to the body of the connector and then on to the mating half that is mounted on the chassis. A poor or inadequate 360 degree shroud increases the inductance of the shield connection. “Pigtails” are lengths of wire soldered to braid shields, ends of braid shields twisted and tinned, drain wires from foil shielded cables, or connector pins used to connect shields, and all are ineffective at providing a good earth/ground termination even when they are less 25mm (1”) long. Whatever the pigtail configuration, it introduces a series inductance into the shield’s termination. This will dominate the transfer impedance of the complete assembly. The flux from the interference current in the pigtail wire links with the internal circuit(s), whereas the interference current in the shield generates flux which does not link with the internal circuit(s) when a proper 360 degree bond exists. Pigtails cannot be recommended for use in today’s systems unless the frequencies concerned with emissions or immunity are less than 1MHz. 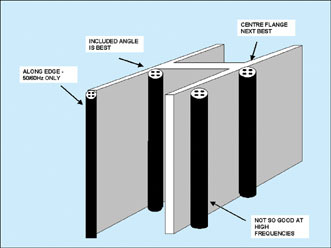 Cable shields should generally be RF bonded to the local earth/ground at both ends, but to do this without suffering cable damage due to large circulating currents (“earth” or “ground loop” currents) in some high-power installations can require the installation of a PEC or a MESH-BN as described earlier. While cable shields have a high resistance compared to the rest of a MESH-BN structure, and cannot carry high currents, when bonded to earth/ground at both ends they improve the MESH-BN because there are so many of them. Traditionally, earth/ground structures have only been bonded well enough to achieve personnel safety. Compliance with most national wiring regulations specify touch voltages of around 50V rms. This has become known as ‘equipotential bonding’, although it clearly isn’t equipotential enough for our purposes. Unfortunately, high-energy transient surges in the earth/ground network can easily produce short duration voltages of 150V or even higher. Such voltages can cause serious damage to equipment and give an unpleasant shock to personnel. It is now clear that such ‘equipotential bonding’ schemes are not good enough for interference control either. The same traditional wiring scheme also specifies that cable shields should be terminated at one end only. This is supposedly to avoid noise being injected into the signal, and even cable overheating by preventing large currents from flowing in the cable shields. While this practice is known to protect cables and remove “hum loops” from equipment whose design is sensitive to EMI, the large potential differences between different parts of a system remain to cause similar problems in the future. The termination of cable shields at one end only, provides no shielding whatever to magnetic fields whose orientation requires that current be driven along the length of the shield to provide a screening effect. This applies to both to emissions from the cable and its susceptibility. Also, the unbonded end provides a window in the overall high frequency shielding, through which external fields will couple with the inner conductors. It must be remembered that such traditional practices were developed at a time when interference frequencies were substantially lower than they are today. (i) Use equipotential 3-dimensional mesh earth/ground techniques (MESH-BN) to reduce the earth/ground potential differences between electronic units that need to communicate over metallic conductors to < 1V rms. (ii) 360 degree bond cable shields to the local earth/ground at both ends, directly to the wall or backplate of equipment cabinets. (iii) Run all cables (shielded or not) very closely along elements of the MESH-BN earth/ground system, using them as Parallel Earth Conductors (PECs) along their entire run. PECs can also be constructed to provide significant assistance with emissions and immunity (plus crosstalk between cables) at frequencies very much higher than 50/60Hz. When implemented correctly, this can potentially reduce installation costs by allowing lower-cost, lower specification cables to be used than would otherwise have been necessary. Co-axial RF cables must always have their shields bonded at both ends. The cable shield carries currents which help shield from interference, and also carries the signal return currents, and it can be difficult to ensure that the two sets of currents don’t interact when wideband shielding is required. Improved shielding (lower surface transfer impedance can be achieved by the use of double shielded cables A(as shown earlier), and by routing the cables close to a suitable type of PEC. It can also be necessary, in especially noisy environments such as near to electrified railway marshalling yards, to bond the cable shield to the PEC at regular intervals (say every 5 to 10 metres). When a LAN cable runs from one equipotential area to another, it may not be practical to bond the shields at both ends, due to the large circulating currents that can occur due to the large potential differences between areas. In such a case, galvanic isolation techniques must be used – essentially creating two or more independent bonding networks (IBNs). Measures must be taken to ensure that no personnel can touch the cable shield at the end that is not bonded to the local earth/ground. Surge protection devices are usually required to be fitted between the signal and cable shields. When using co-axial shielded cables with BNC connectors, RF earth/grounding can be maintained by using capacitive coupling from the shield to earth/ground. The galvanic isolation barriers must be rated to withstand at least 1500V, although 2kV is preferred, for LAN cables inside a single building. Where a LAN cable runs between two buildings which don’t share a common MESH-BN, galvanic isolation of up to 2MV can be necessary to prevent serious hazards when lightning strikes close to one of the buildings. Once more, the proper solution to LAN interfacing, is by the installation of a MESH-BN earth/ground system, so that cable shields may be 360 degree bonded with the cables run closely along the elements of the MESH-BN, using them as PECs. · measures must be taken to ensure that personnel cannot touch the capacitively bonded end of the shielded cable. Connectors which incorporate feed-through capacitors for the shield have been proposed, and should be capable of addressing the first bullet point above. But none have yet been marketed by connector manufacturers and they are likely to be very expensive if/when they ever are. Capacitor shield bonding cannot be recommended as best practice for either EMC or safety. However, it may prove a helpful remedial technique for dealing with specific interference problems on a pre-existing “traditional” installation that does not have equipotential bonding or PECs, and where cable shields have only been bonded at one end. Galvanic isolation is the preferred alternative to the use of PECs and terminating cable shields at both ends. The method of isolation used: fiber optics, wireless, microwave, laser, infra-red, must have transmitter/receiver electronics rated at the full fault/surge voltage (rarely a problem). Care must still be taken to ensure that the transmitter/receiver electronics are free from interference susceptibility and don’t themselves emit interference, so the basic rules for high performance earth/ground bonding in the isolated area still stand. Fiber optic communication is extremely EMC friendly, and is capable of supporting almost limitless common mode potential differences. However, special care must be taken with fiber that uses metallic strengthening or armour. Safety could be accidentally compromised if any metal elements in the fiber optic cable are not fully protected where they cross a zone boundary (e.g. enter an equipment). In general, earth/ground loop currents are caused by voltage differences in the earth/ground structure due to heavy power consumption and so have a frequency content in the 50/60Hz (and related harmonics) range. At low frequencies, the low impedance of PECs diverts most of the current away from cable shields, allowing RF bonding at both ends, without the problem of overheating in the cable shields. Magnetic fields, that are another source of earth/ground loop currents, are reduced to negligible proportions by running cables close to their PEC. “Close” in this context, means <25 mm (1”) from the base of a tray, duct, conduit or no more than a few millimetres away from a dedicated earth/ground conductor (green/yellow safety earth wire or copper strip). During the normal lifetime of a system it is inevitable that damage to the insulation of cables will occur. The effect of earth/ground loop currents, when the neutral of a power cable, an isolated earth/ground wire or the shield of a signal cable links unintentionally to the earth/ground structure, is often a major problem. The current that flows in a conductor that has such an earth/ground fault depends on its impedance and the earth/ground potential difference at the position of the fault. If the current is large, the fault will be discovered quickly. If the current is so small that its effect is not easily detected, then the fault will go undiscovered for many months. In between these two extremes is the fault current that: heats up cables, but not enough to be a fire hazard; magnetic field interference due to relatively high current flow over a large loop; induced interference in a sub-system that is part of the circuit or close by the fault position. The detection and solution to some of these effects is often very difficult and expensive. A properly installed MESH-BN will reduce the impact of such faults, by reducing or eliminating the earth/ground potentials that are at the root of the problem. The installation will be able to tolerate much higher levels of fault occurrence without operational problems. There are some cable-coupling problems that are better dealt with by not shielding the cable. In some cases filtering is a more convenient solution, or the equipment designer has implemented other techniques to control interference to or from the interconnecting cable. (ii) electric field coupling is more balanced to each half of the pair than if they were not twisted. Twisting the pair does not help in reducing the effect of common mode coupling, but is extremely effective at controlling the conversion of common mode interference to differential mode. Even power conductors benefit from twisting. Cable performance specifications for Local Area Networks and data communications applications are published in ISO/IEC 11801 and EN 50173 – Generic cabling systems. The documents refer to “Category 3” cables being suitable for operation up to 10Mbps and “Category 5” up to 100Mbps. The purpose of these specifications are to allow “structured cabling” to be installed in new buildings, without detailed knowledge of the applications that the system will support in the future. At the moment, there are no EMC specifications for cables, only for equipment suppliers. Thus, equipment that is designed to be compliant when using UTP cables, may not benefit from shielded cables. But if a sub system requires shielded cables, it is unreasonable to expect a UTP installation to be compliant. The termination configuration of ribbon cable conductors is rarely under the control of the system designer, but it can have a serious impact on the interference coupling to and from the cable. The main problem is, as always, the enclosed loop area for signal and return currents. The worst case is where a single conductor near one edge of the cable is used for all the return currents. Leaving a large area between signal and return currents is inviting differential coupling into and out of the ribbon. This not only guarantees that there will be emission and immunity problems, but any good EMC practices used in the equipment or PCB design will be nullified. (iv) “Round and flat” cable rolls a ribbon cable up into a tube and sleeves it with a braided shield. Excellent. Allows use of mass termination connectors with proper 360 degree shielding and shield termination. Cables can be divided into four classes with respect to their interference potential. Different classes of cables must be physically separated and run in different trunking or conduits. Each trunking structure must keep the cables close to a parallel earth conductor along their whole length. If cable classes cross each other, they must do so at right angles. 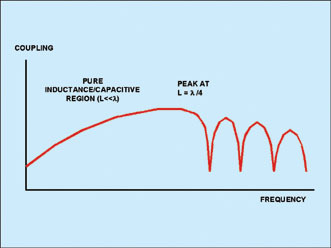 Class 1 generally applies to all low level signals such as microphones, but also line level audio, high-rate digital and analogue communications, ethernet, video, RF receiver cables from antennae and all other signals with full-scale range less than 1V, 1mA, or where their source impedance is higher than 1000 ohms, or their signal frequency or rate greater than 1MHz. Class 1 cables must always be high quality shielded twisted pair cables with shielded connectors and continuous 360 degree shielding and no breaks. Screw terminals are not allowed. Always follow the manufacturers recommendations for cable types, connectors and wiring routes when installing equipment using such sensitive signals. Class 2 covers ordinary analogue (eg. 0-10V, 4-20 mA, less than 1MHz) and low rate digital bus communications (RS232, RS422, RS485, Centronics). These signals should use shielded cables, with flat ribbon cables enclosed in screening jackets or shielded “round and flat”. Digital (on/off) inputs and outputs such as limit switches are also covered by Class 2 cables, as well as encoders, non-data bus low rate signals and the outputs from DC power supply units. AC and DC power distribution up to 230/415V can be treated as Class 2 inside an enclosure, after it has been filtered in the cabinet. Single wires may be used for these circuits, but twisting is preferred with phase and neutral associated with a load in the same bundle. Twisted pairs, triples, quads, are always preferred for shielded or unshielded cables in Class 2. Special arrangements for connecting multiple return conductors must be made, if an electronic unit doesn’t provide enough terminals or pins for all the return conductors. Class 3 covers externally supplied AC (up to 230/415V) or DC power, control circuits with resistive and inductive loads where all inductive loads, such as solenoids and contactors are fitted with suppressors as recommended by their manufacturers. External equipment must be considered noisy unless it is known to have emissions in line with harmonized EMC emission standards. Such units should be fitted with internal filters. Induction motors can be considered as Class 3, if they are controlled from adjustable speed drives with sinusoidal output filters, and their AC supply is Class 3 or better. Class 3 signals and power can use shielded, multiconductor cables or single wires. Twisted pairs, triples, quads are preferred. Screw terminals are allowed as long as the exposed conductors are less than 30 mm (1.25”) long. Class 4 applies to cables supplying power inputs, outputs, DC links to adjustable speed motor drives, (DC, AC, steppers, servos etc. ), welding equipment, cables to on/off controlled DC motors, slip-rings and similar electrically noisy equipment. It is best to check with the manufacturer of such potentially noisy equipment in case special filtering, cables or routing is important to control interference. Details for installing ferrite toroids/clips or filters should be followed exactly as instructed. Class 4 cables should use high quality braid shield with properly made shield connections. Pigtails are definitely not allowed. The conductors should be twisted pairs, triples or quads, or as required, to twist together all the send and return current paths associated with one signal or load. Screw terminals are fine, but the exposed length of conductors should be less than 30mm (1.25”), unless a manufacturer advises otherwise – always check. Class 4 also covers control cables to unsuppressed inductive loads (relays solenoids, contactors, etc.). These may use unshielded twisted pairs, but only if they operate infrequently (once every few minutes or longer). If their operation is more frequent, then shielded twisted pairs and suppression components must be installed. Power cables to and from legacy equipment should also be segregated to Class 4 trucking. Unshielded power cables should always be run close to a PEC. The armour on a cable can be used as a PEC when available, but users must be made aware of this so they don’t ruin its PEC performance in future modifications to the system. Cables to RF transmitting equipment are also Class 4. Cable type, routing and terminations must only be exactly as specified by the manufacturer. There must be no breaks in the 360 degree shielding of RF cables. Cables carrying AC voltages greater than 400V and DC voltages higher than 230V are commonly called High Voltage (HV). More correctly, these voltages should be divided into Medium Voltage (MV) – Class 5 and HV – Class 6, according to the IEC’s definitions. MV and HV cables are much more exposed to external disturbances such as lightning, powerful surges and transients caused by the operation of heavy-duty switchgear. While there is a much greater awareness of EMC matters today, the types of cables used are defined by the power network engineers. However, running all the conductors associated with a given load in a single cable or bundle of cables, and using its armour as a PEC (where load currents allow) will be seen as good practice, and help to control unnecessary disturbances. All the conductors associated with a signal or load must always be run together in a bundle over their entire length, even if this means using more copper. Each multi-conductor cable or bundle of single wires should include an earth/ground conductor bonded to the local earth/ground at the equipment to which the cables are terminated, to create a PEC. It is good practice to include such a conductor even if the cable is shielded or armoured., as it is less likely to be disconnected during future modifications. This additional earth/ground conductor acts to reduce magnetic coupling at low frequencies and helps to reduce crosstalk. The extra earth/ground conductor can have the same dimensions as the other conductors in a bundle when run along the PECs of a properly bonded MESH-BN system. However, it will need to be sized appropriately for the continuous surge currents it may be called upon to handle in less well bonded situations. All shielded cable must have 360 degree RF bonding at all connectors and glands, unless their signals really are non-aggressive and insensitive, when very short pigtails shield terminations may be acceptable. Programmable Logic Controller (PLC), digital control and analogue I/O signals are often regarded as benign largely because the signals they carry are slow or infrequent. Regrettably, many systems available in the market place carry common mode noise on all their I/Os, generated by the operation of their internal digital processing. This noise has a very much higher frequency content than would be expected from the signals themselves. Unless the manufacturer of the equipment states otherwise (and you have confidence in him), these signals should always be given shielded cables with 360 degree RF bonding at all connectors and glands. Where the installation is close to a source of high-level electromagnet pollution, such as a radio or TV broadcast transmitter (or both), additional protection may be required. Quite often, only a small part of a building is affected by high level fields, and then the best approach is segregation – no equipment installed in, or cables run through the area. If this is not possible, there are a number of methods that can give additional protection. All signal or power cables that must run through the area are given an extra shielding layer that is 360 degree RF bonded at all joints, connectors and glands. This must be done regardless of cable Class. Thus a Class 1 cable is given a double shielded cable. A foil shielded cable with an overall braid shield can make a large improvement in the cable’s shielding effectiveness. Isolated double shields can be even better in extreme circumstances. 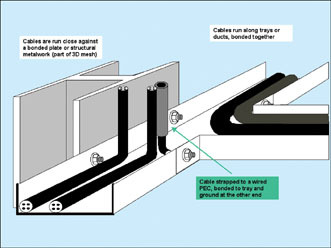 It is possible to use normal cables (for their classes) if the cables merely run through the area in rectangular ducts used as PECs, with the conduit fitted with RF bonded covers. Circular conduits can also be used, since the extra metalwork acts as extra shielding. Circular conduit with 360 degree bonded joints and terminations can provide the best shielding performance and is extremely cost effective in any extreme electromagnetic environment. A useful technique, where the fields concerned are below 20MHz, is to expose a short length of cable shield or armour (about 1”) and bond the shield to the PEC every 10 metres (30 feet) or so. The bonds should not be regular, but should be randomly varied between 6 and 12 metres (18 and 48 feet). Capacitors can be used instead of direct bonds, to help keep 50/60Hz currents out of the cable shields, but this is not necessary if the earth/ground system is a properly structured MESH-BN. There are many occasions when the “noisiness” of a sub-system or its cables is unknown. Installing new equipment in an existing system is just one example. The most effective way of identifying electrically “noisy” cables and apparatus is by using a portable spectrum analyzer with hand-held probes. The minimum frequency range for the analyzer and probes is between 100kHz and 1000MHz, which is easily achieved at low cost. 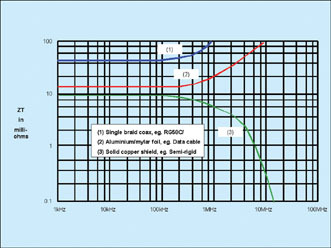 Field strength values for the four classes of cable cannot be given because the cable classes are relative and not absolute. However, it will soon be obvious after spending a small amount of time with a close-field probe, which cables should be kept away from other more sensitive ones. The analyzer/probe method is not so easy to use for identifying sensitive cables, although it can be done. It is usually much quicker to get this information from the site engineer. In existing installations, it is quite likely that different cable classes will be mixed up together and not segregated. New cables should be segregated from each other, and from existing cables. The extra time and cost of this will be repaid by improved operational reliability. Determining which class a cable belongs to, not only allows you to choose the correct cable type and termination, but to segregate different cable classes to prevent them from interfering with each other. Figure 16 shows the minimum separation distances that should be maintained between the different classes, assuming a continuous flat metal PEC under them all. If separate PECs are used, a larger gap between cable classes is required, unless each PEC has side-walls (e.g. open ducts, trays) – tall side walls are best and can reduce the spacing requirements. Where there is no PEC, spacings between classes of at least ten times the diameter of the larger bundle is required to achieve the same segregation performance as with a PEC. If a PEC is completely enclosed, such as a covered duct or circular conduits (with proper RF bonding at all joints), then no minimum spacing is necessary between cable classes. Even so, it is best practice to arrange ducts and conduits in order of cable class, to ensure that Class 1 cables are always furthest from Class 4. All cables should be run close to their PECs at all times. “Close” means, no more that a few millimetres away, unless the PEC is a circular or covered conduit containing only one class of cable. If cable classes must cross, they should only do so at right angles, with as much space between them as possible. Best practice is to separate the crossing point with a PEC running between the cable classes. Where it is necessary for Class 1 cables to cross Class 4 cables, one of them should be run in an enclosed PEC. 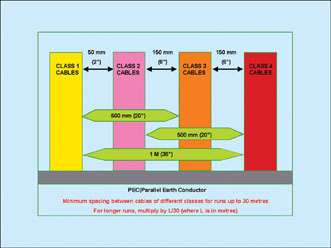 The minimum spacing between Class 4 and Class 5 cables is 150mm (6”). Class 6 cables should be a further 150mm (6”) away from Class 5. Class 1 cables must be at least1.25m (40.4”) away from Class 5. 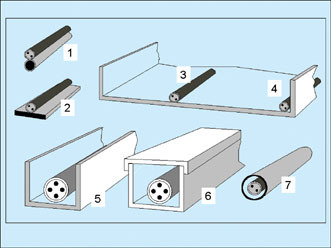 Larger spacings may sometimes be required for classes 5 and 6 for insulation purposes, or for preventing damaging flash-overs during fault conditions. Separation of cables in the same class is sometimes necessary. For instance, Class 1 cables include sensitive analogue cables, which can be sub-designated Class 1a, high-rate digital signals in twisted pairs (Class 1b), and high-rate digital in coaxial cables (Class 1c). These cables should not be bundled together. It has been found that for good signal reliability, 1a, 1b and 1c should have a minimum spacing of 10mm (0.4”) between sub-classes, keeping each bundle as close as possible to the PEC at all times. Equipment manufacturers are becoming ever more aware of cable interference problems, so it is always best to consult the various manufacturers, if there is any doubt about inter-class cable routing procedures. All cables between equipment should follow the same route. (ii) there should be a single interconnection panel for each item of equipment. The single interconnection panel per unit helps to prevent the inevitable circulating currents in the cables and metalwork from flowing through the apparatus, where it is possible to cause interference with the internal electronics. Where a more than one route and/or connection panel exists, each should be given its own PEC. Note that in this case, higher earth/ground currents are to be expected. Segregation of cable classes may not be possible in a single tray. The solution is to stack a number of cable trays vertically and electrically bond them together at all of their support pillars. The stack of trays should all follow the same route between any two items of equipment. Horizontal and vertical minimum separation distances between the cable classes must be observed. Always run send and return conductors close together. This is illustrated in figure 18, and is important to reduce magnetic field coupling. There will be some physical path difference between unswitched conductors etc., but the idea is to minimize path differences wherever possible. Only one connector panel is allowed for a single cabinet or rack bay. The panel may be mounted at the top, bottom, side or rear face, but external cables must only enter at one face, preferably along one edge of the grounded panel or backplate. High level circulating currents will then flow from cable to cable via the connector panel or backplate, but not flow through the rest of the cabinet, where they might interfere with the electronic units. Modern best practice for EMC in installations require the use of metallic cable trays, conduits and even heavy gauge earth/ground conductors as Parallel Earth Conductors (PECs). The cabinet, enclosure or backplate should be provided with the means of connecting the necessary PECs. The most important function of a Parallel Earth Conductor is to divert heavy earth/ground loop currents away from shielded and unshielded cables. Earth/ground currents and surges from lightning are low frequency events, so the most important electrical property for a PEC is that it should have a very low resistance and a sufficient current carrying capacity. The majority of cable support systems have enough metallic cross-sectional area to provide the low resistance and high current capacity path required. This is especially true for meshed earth/ground systems (MESH-BN) where the currents flowing in PECs is much lower. Any shield or earth/ground conductor external to a cable should be treated as a PEC and bonded to earth/ground at both ends. Cable armour should always be used as a PEC, but will only be able to provide protection if it is continuous and bonded correctly at both ends. Loop currents flowing in earth/ground conductors, due to magnetic fields, can be reduced by running the cables very close to the metal of the PEC throughout the length of the run. PECs can also be used to control higher frequencies, as shown in figure 19. Cable trays are usually perforated with slots to make cable fixing easier. Unfortunately, slots reduce the high frequency performance of the PEC because the gaps in the metal interrupt current flow and therefore increase the transfer impedance of the structure. In particular, ladder and basket type cable support systems are only able to control 50/60Hz disturbances. In some cases, a wired PEC may be required as well. Small holes have the least impact on EMC, but a number of tray manufacturers have compromised with short longitudinal slots. PECs must be electrically bonded to the local equipment earth/ground at both of their ends, to all their support structures along the run and any other metalwork at every available opportunity. This is to help create a meshed earth/ground structure, which also helps the PEC to function effectively. Joints and end-terminations must be bonded using the appropriate methods for the frequencies to be controlled. Cable trays and rectangular conduits need to make electrical bonds to the cabinet wall (or top, bottom, sides or rear), using “U” brackets or similar with multiple fixing points. 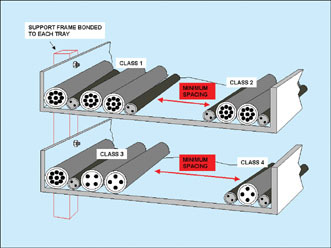 Round conduit can bond to an enclosure wall or backplate using circular glands. Where necessary, remove paint or other insulating layer to ensure a good electrical bond, and apply corrosion protection. (i) The best high frequency performance is obtained by routing the cable in an included angle. (ii) The next best route is at the centre of a flange or rib. (iii) Routing a cable along a flange is only good enough to control 50/60Hz interference currents. Cables should be run very close to their respective PECs at all points along their routes. Where a cable changes direction and leaves the main cable route, an electrically continuous PEC should be provided for it. For very low frequency cables (50/60Hz), the cable can be strapped to a wired PEC. (i) Run tray or duct right up to wall or floor. (ii) Bond the tray or duct either side of the gap using at least one short, wide braid strap. If braid is not practical, use several heavy gauge wire straps, spaced across the width if the tray or duct. The bonding conductors must be rated to withstand the worst possible earth-fault or other current (which could be very high since equipotential mesh bonding may also be restricted by the wall or floor) and must follow the cable route. (iii) Such breaks in the PEC are weak points where high frequency interference can couple to the cables. If problems arise, use “knitmesh” around the exposed lengths of the affected cables, bonding it to the PEC on each side of the wall/floor. A heavy duty cable or braid may also be needed in parallel with the knitmesh wrapping if the PEC is to carry high levels of current. (iii) where cables must leave the protection of the PEC, allowance should be made in the project plan for early remedial work to provide a PEC. For many audio engineers that have been continuously working in the industry for as long as I have (nearly 40 years), most of the information in this article will seem like sacrilege. I too, thought that it was all pretty far-fetched, when I first learned of the techniques necessary for designing electronic components and systems to be able to pass the EMC Directive. You will know all the arguments against such concepts, and I have personally rehearsed them too. My interest in even trying out some of the techniques described here, was brought about by my sheer frustration in spending hours and hours chasing hum, buzz and RF interference noises during component or system design, testing and commissioning, year-in and year-out, rather than keeping within the law. It was with much trepidation that the first basic system was put together with all I/O cable shields bonded at each end, and mesh grounding techniques used between the console, local and remote racks. Many people attended the first installation, just to get a look at my face when the hum got so loud that loudspeaker cones would leave their cabinets horizontally. We were all in for a big surprise. Instead of loud and uncontrollable noise - there was silence. After some moments, a distant voice echoed my own thoughts: “Is the system turned on yet?” Three different voices answered “yes”. The owner of the dissenting voice who muttered: “It can’t be.”, pushed a fader to “+10” and pressed the appropriate play button. Everyone ducked as high performance audio filled the room, very loudly indeed. None of the information in this article is just “theory”. All of the techniques described here are based on practical experience with practical components and systems. I have put in some additional physics to help explain why the techniques work, and probably got a bit “carried away” with the extra information in sections 8 and 9. But the more I learn about how to use these techniques, the more detail I find necessary to include in the explanation of why it works. Note that I started with the safety aspects of electronic system design. We all need to be able work safely. Star ground power systems can provide good safety, but only at power frequencies. Today’s audio systems must be able control interference phenomenon many tens of MHz above the required audio pass band, due to the necessity of incorporating processor controlled devices that have become part of the system specifications. Unfortunately, even well designed and maintained star ground systems cannot help us with high frequency interference control. But few star ground systems remain safe over the longer term. They tend to degenerate into multi-ground-loop nightmares. I come across star ground systems that have deteriorated so badly over the years, that engineers have to disconnect the protective ground conductors on the AC power input cables of some equipment, just to be able to obtain a reasonable noise floor, disregarding the safety risks this introduces. This problem is certainly exacerbated by large numbers of audio equipment still being designed with incorrect shield termination methods (and other EMC design deficiencies). However, the old methods of eliminating ground loops, but leaving the driving potentials that cause the current to flow in place, must now be considered to be a retreat from good design practice. Many audio experts still insist that bonding audio cable shields to ground at both ends produce noise artefacts called SCIN (Shield Current Induced Noise), due to the imbalances in balanced audio cables. In practice, the input and output filter techniques discussed in section 7, have no difficulty in controlling such problems, as well as providing excellent EMC. Now, even if it could be proved that lifting the shield at one end gives measurably better results for audio band noise tests - this is no use to those of us that must use processor controlled boxes within an audio system (analogue or fully digital). Only fully shielded, filtered, and mesh bonded cable structures stand any chance of being able to control the overall interference problems associated with this type of audio/digital control system, give good sound quality, and produce a safer working environment. Such systems are also easier to design and less costly to test and commission [3 and 6]. Better still, you don’t have to “fiddle about” trying to figure out which end of the cable shield to bond to ground, or which to “lift”. Much less frustrating, and a more efficient way of working. Customers who specify complex computer controlled audio systems, get rightly upset when interference couples with the cable system and causes the installation to malfunction. At the same time, they insist on the highest quality audio performance, and a safe working environment. Since the techniques described in this article achieve all three criteria extremely well, they should now be considered to be the best engineering practices for pro-audio systems. “Bonding cable shields at both ends to reduce noise”, Keith Armstrong and Tony Waldron, EMC + Compliance Journal, May 02 (www.compliance-club.com).